← June 5th – Meeting for Members and Interested Urbanists! 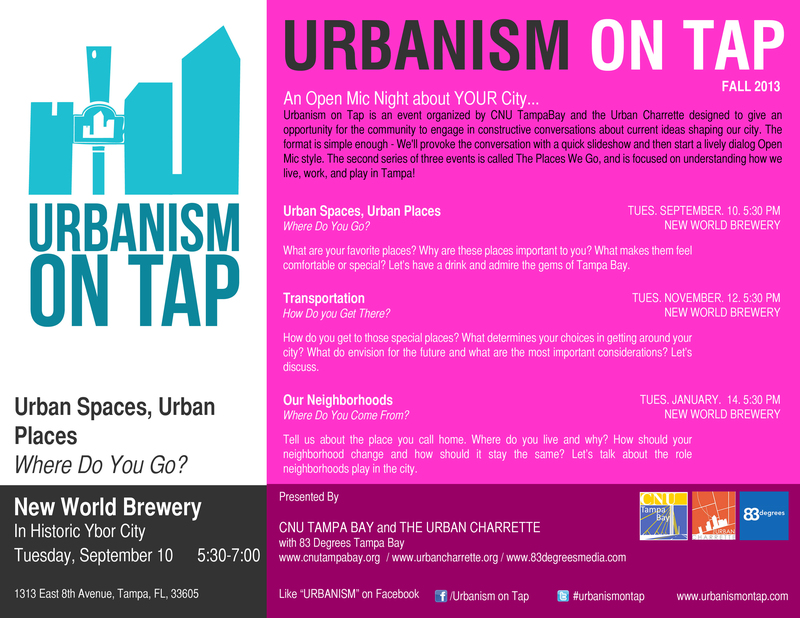 Urbanism on Tap is an event organized by CNU TampaBay and the Urban Charrette designed to give an opportunity for the community to engage in constructive conversations about current ideas shaping our city. The format is simple enough – We’ll provoke the conversation with a quick slideshow and then start a lively dialog Open Mic style. The second series of three events is called The Places We Go, and is focused on understanding how we live, work, and play in Tampa! What are your favorite places? Why are these places important to you? What makes them feel comfortable or special? Let’s have a drink and admire the gems of Tampa Bay. How do you get to those special places? What determines your choices in getting around your city? What do you envision for the future and what are the most important considerations? Let’s discuss. Tell us about the place you call home. Where do you live and why? How should your neighborhood change and how should it stay the same? Let’s talk about the role neighborhoods play in the city. And the winner is…Urbanism on Tap!